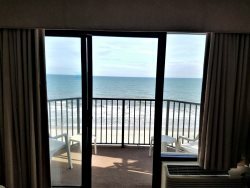 Oceanfront suite at Ocean Park - Sleeps 10! This 2 bedroom/ 2 bath unit sits on the 23rd floor (highest floor in the building!) and offers an amazing view of the Atlantic Ocean. The condo has 2 balconies, one with a stunning view of the ocean and the other of the city. Feel free to pack light as this condo has everything you need--One bedroom as a queen bed and the second bedroom has a king size bed with all linens and comforters provided. Each bathroom comes with 8 towels, 8 washcloths and toiletries. The kitchen includes all necessities such as a coffee pot, toaster, pots, pans, all cooking utensils, silverware, and much much more! ****PLEASE NOTE*****The Palace Resort is currently completing an exterior project that will take place until the end of April 2019. Our City View balcony is complete and you will have access to it. However, our Oceanfront balcony is currently being worked on. Guests will not have access to it. There could be noise and odors that affect your stay. Pools and amenities may also be affected. If given advance notice, we may be able to give you pool access to another place. We apologize for any inconvenience but because you are being forewarned, there will be no refunds given. Our prices are already marked low due to this. great location, great communications, perfect host. this is a great location for anyone. This was an awesome experience to rent this property for a weekend. Larrowe's property was the perfect place to get away and feel the comfort of being on vacation. I've been to Myrtle Beach plenty of times but this trip will be one memorable moment! I would have to put Larrowes above all being the view, location along with the ambiance was a total package. Was a very clean place, responded quickly when needed, and overall made our trip great!